Sometimes it’s pretty hard keeping up with all the new doo-dads that are part of a new car’s comprehensive safety equipment list. Some of the new names are new for the sake of being new – to disguise the fact that they are safety systems that have been around for a while – sure, over time, the old has been refined. However, the new safety systems that Toyota, and others, are working on are pretty cool. Get a load of these features. Toyota has announced that they have some vehicle safety advancements that focus on the older drivers and pedestrians. This is in response to the accident statistics, in Japan, that reveal that more than half of traffic deaths are of people aged 65 and over. Incredibly, Japanese statistics show that pedestrians account for more fatalities than vehicle occupants. As well as protecting people inside and outside the car when a crash occurs, cars like Toyota are looking at monitoring the occupant’s health and helping them to avoid a crash in the first instance. Toyota’s Emergency Response Technology deals with a driver who collapses at the wheel because of a heart attack or a sudden blackout. Obviously, this is a scenario that can cause very serious accidents. What the new technology does is it monitors cardiovascular functions through the driver’s grip on the steering wheel. This can detect risk situations. Toyota will continue their research on this amazing technology. Pre-Crash Safety (PCS) is another biggie that Toyota is working on. PCS incorporates collision-avoidance technology to create a vehicle that is less likely to become involved in an accident. Toyota have progressed their system to the place where the system will predict when a collision is imminent and will initiate measures to reduce damage and the risk of occupant injury. With the use of radar and a miniature camera, the vehicle will monitor the road ahead and apply brakes if the driver doesn’t. How effective the end result is depends on road conditions and circumstances. Additions to this will be a system that will help the driver steer a safe course in an emergency. PCS would monitor locations of roadside obstacles and approaching vehicles to analyse, and respond, to collision risks and change any action, accordingly. An Adaptive Driving Beam system has already been employed by many premium car manufacturers. This is a system that automatically dips the headlights when taillights are coming into view in your lane ahead of you or when the system detects an oncoming car in the opposite lane. Once no cars are detected ahead in either lane, the system automatically switches the headlights up to full beam again. Jaguar has employed a pop-up-bonnet system that looks to protect pedestrians who are on course for a collision with the car’s front end. As the system detects the pedestrian ahead of the car, the rear-bonnet section rises up to create a gentler slope at the time of impact. This technology makes for a better impact (no impact is nice) and reduces the level of head injury for the unfortunate pedestrian. Quite a few Australians are thinking of heading over to the other side of the Tasman during the upcoming Rugby World Cup. And quite a few of them are considering hiring cars to get around while they’re over there. What do you need to know about driving in New Zealand and what are some good road trips to do while you’re over there? Driving in New Zealand is pretty similar to driving over here, and you can use your Australian driver’s licence without any problems if you’re only over here for the Rugby World Cup. You won’t have any hassles about remembering what side of the road to drive on – it’s just the same. The give way rules at intersections and roundabouts are considered to be unique but it’s not that different to what happens over here: if you’re turning left, give way to anything that’s going to conflict with you. If you’re turning right, give way to things going straight through. If you’re going straight through, give way to anything going straight through from your right. If you want more details, you can read about it on the NZ Transport Agency’s website. Regarding fuel, you have the choice of 98 octane unleaded, 91 octane unleaded, diesel and LPG. CNG is available in the North Island only. Oddly, New Zealand doesn’t seem to have cottoned onto the idea of ethanol and ethanol blends much (at least not yet), so don’t go looking for these at the bowser. Fuel prices are higher than over here, even when you take the exchange rate into account, so it could be wiser to hire a more frugal vehicle – a little hatchback might be all you need. The garages tend to warn you if they’re the last one for a big stretch, although their big stretches aren’t as big as ours. That’s the required stuff – now for the fun bits. What’s a good drive to do while you’re over there? New Zealand is tiny compared to Australia, but that doesn’t mean that you can’t get some good drives with good scenery. You can get from one end of the country to the other in a couple of days (provided the ferry crossing in the middle works out right), but most visitors like to take their time. Australia will be playing in a number of places: Auckland, Wellington and Nelson. Two of these are in the North Island, and one’s in the South Island, so you can plan your drive depending on where you want to go. see, and you may as well make the most of it while you’re over there, especially if you’re down south. The fishing season will have just started, and you can probably find a bit of time to do a Lord of The Rings movie location trip if the fancy takes you that way. If you want to take in both islands, give a little thought to how you’re going to get from north to south or vice versa. You can put a hired car on the ferry, but it may be easier to hire separate cars on each side of Cook Straight, depending on how much luggage you have – if you have a fair bit, keeping to the one car might be the easier option. The Baby Boom generation is getting older. We all know the effects that this generation has had on the world in general, including the automotive world – would the VW Beetle and the Mini have been as popular in the 1960s if families hadn’t needed somewhere to fit their Boomer children (and the older Boomers became more mobile and took the wheel)? Around the world, planners and developers are looking at this generation and are wondering what the effect will be on the roads as they hit the golden years. One vehicle marque that has put a bit of thought into this is Toyota. To meet the foreseeable demands of an aging population that (a) isn’t quite as fit and flexible as it used to be, (b) still wants the freedom of the motor vehicle, Toyota have come up with the Welcab concept. The Welcab is not an individual model but it is a set of features that are incorporated into popular Toyota models, such as the Hiace van and others, such as the Previa and Estima. In a nutshell, a Welcab equipped vehicle is set up so that mobility scooters and wheelchairs can get in and out of them easily – or the occupant of the wheelchair/mobility scooter can get in and out without too much hassle. And yes, this does include drivers who get around in mobility scooters the rest of the time. Of course, it’s not just older drivers who benefit from the Welcab concept. Drivers with limited mobility and drivers who act as caregivers to the disabled or otherwise wheelchair-bound are also catered to by the Welcab. The most popular Welcab is the Hiace van with a wheelchair access ramp at the rear, as commonly seen in wheelchair taxis and vehicles owned by nursing homes. Toyota’s Welcab vehicles come from the factory floor with all the features set up for limited-mobility drivers and/or passengers, which makes them different from the after-market additions that can be fitted to other vehicles to make them suitable for wheelchair users, such as the gizmo fitted to a Subaru Legacy driven by a guy I knew with cerebral palsy – this gizmo lifted his wheelchair off the roof of his car and popped it down by the driver’s seat to be unfolded and climbed into, and vice versa. Other vehicle manufacturers are getting into the act, especially (it seems) in Japan. Mitsubishi has the Hearty Run (one of those “use the dictionary as a dartboard” names); Honda has the Fit Sports and the Almas. Honda also has the swivel seat option in the Jazz. Other marques are getting on board, although most cars for limited-mobility drivers tend to be after-market adaptations rather than factory floor versions. Given that none of us are getting any younger and that we’ll all be a bit old and creaky one day, it’s likely that we’ll see more cars coming off the factory floor with ease-of-access features. In the meantime, however, if you’re finding it a bit harder to get in and out of the car, an after-market swivel seat might be the way to go – these usually look like two discs stuck together, allowing you to get in and out a bit more easily. The new buzz phrase for car marketers is ‘Park Assist’. This is where your car literally parks itself, so we are going to look into this a little further. We’ll show you some very clever and amusing TV commercials later which demonstrate the totally ‘hands free’ parking ability, but first we thought we’d do a survey of all the parking aid devices available to you now. The very basic parking aid is the front/rear windows and parking mirrors (and, in some cases, an outside helper!). A good eye, some skill and patience and, hopefully, you’re happily parked in a tight spot-or you’ve driven past. That’s all there was to help you not so many years ago. 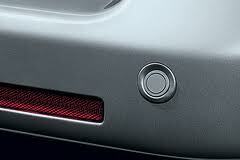 Then parking sensors became standard equipment on some luxury vehicles. The sensors were moulded into the bumper bars and emitted a more frantic buzzing noise the closer the car came to an immovable object. They gradually worked down the option range to the most economical models today. Even if it’s not available as an option, or your car doesn’t have them, after market kits can be purchased and fitted for around $350.00. Considered an exclusive extra just a couple of years ago, the parking camera is now much more commonplace, either as original equipment or as an after market extra. 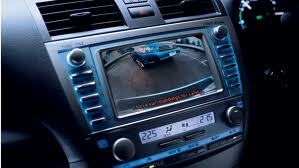 It’s now common to have the rear camera option on a new car, particularly when an in-dash sat/nav is specified. This option is very popular as a safety measure and certainly makes parking even easier. Don’t fret if you don’t have sat/nav or don’t have it listed as an option in your preferred car as they are now available as an after market option with a separate view screen. It will cost you around $800.00, and you’ll never have to worry about reverse parking again. But we’re not finished yet, as the granddaddy of them all is fully automatic park assist. Welcome to the world of the driverless car – literally! Automatic Park Assist is what they call it, but we think the phrase is underdone – as it does virtually everything for you. You don’t even go near the steering wheel, as all you control is the foot brake and accelerator as it manouvres you into the tightest of parking spaces. And it’s no longer just for the world of the elite car buyers, so read on! First, let’s show you what they mean by park assist and show you a couple of really clever and amusing T.V. commercials. The first one is from Volkswagen. It’s for the Tiguan in Sao Paolo, Brazil. That’s a simple and clever ad that illustrates a remarkable piece of car technology, but that’s in South America! The good news is that you can get it here too with your new VW. For Australia a slightly simplified version (VW call it Park Assist 1) can be specified in a new VW Golf. However, the brand new Passat also has the full version (Park Assist 2) for an extra $1800.00 which sounds pretty good value for such an enhanced safety aid..
A Ford TV commercial also caught our attention. This one is for the Ford C-MAX and was shot in Paris. That’s a very different approach to VW and features a dog parking the car! The bad news is that the C-MAX is not available in Australia – but there’s good news too. Ford Australia have told us that this really clever technology is available as standard equipment in the brand new Ford Focus Titanium. They tell us that the price on-road will be around $33,000 – $34,000 and deliveries start in September. Clearly “Park Assist” is no longer just in the realm of the wealthy and exotic, and will rapidly be adopted by more and more car makers and be made much more approachable in retail prices. Have you tried it? If you have – or if you have any thoughts on this new driverless technology, let us hear from you below. Best Ever Private Sale Ad? There’s a guy in the UK who wants to sell his car. It’s a Porsche and he’s probably created the best private car ad ever. Have you seen an ad as good as this for any private sale, let alone a 25 year old car?? Every now and then, most of us have need of a trailer. There are many different trailers and loads one can tow. There’s the camping trailer for the weekend away; or what about the caravan, instead, for a little more luxury. Perhaps some of us will have a horse and will require a vehicle to tow the horse float. Most of us could do with a small trailer to get rid of household rubbish to the dump. One thing that’s very easy to do, particularly if you have little experience, is to mismatch a heavy load to a small tow vehicle. Now there’s no way a Mini is going to pull a tandem trailer full of wood without straining. What are some things to look out for? Firstly, do you have the right vehicle to tow? Some of the very small cars on the market are, in fact, not well equipped for towing. A lightly built vehicle is going to struggle to tow much more than 500 kg and sometimes the vehicle manufacture will actually state in the car’s manual that it is not fit to tow. Do check whether your Ford Festiva or your Fiat Punto is actually recommended for towing. Sometimes it comes down to the car’s structural integrity being too light to cope with the stresses that a trailer will put on the car’s bodywork and chassis – and the manufacturer will state this. When considering towing, make sure that your car has good brakes, plenty of torque and power, is preferably rear-wheel-drive or four-wheel-drive and has a suitably rated towbar for the task at hand. Light trailers are, generally, fine for any type of car. Front-wheel-drive cars with a load on the back are ok for light towing that is done on the flat; however, for heavier trailers front wheel-drive cars are not ideal. Their front wheels can sometimes struggle for traction and cause a lot of stress on the car’s driving componentry – particularly when going uphill on gravel roads. In some cases, the gradients on gravel roads will be too steep for a front-wheel-drive car to cope with and you’ll get nowhere. It’s very funny for bystanders to watch but not so great for the driver of the car, and the repair bills. A little trick to remember when towing a trailer: Make sure that your load is well distributed on the trailer. Have the heaviest part of the load sitting over the trailer’s axle/axles. If you don’t distribute the weight correctly on the trailer, the unbalanced weight can greatly affect the vehicle’s handling, making driving dangerous. Numerous times trailers that have too much weight behind the axle have caused the tow vehicle to jack knife. Also, with too much weight sitting in front of the trailer’s axle the tow car can be pushed heavily down at the rear which lightens up the front end grip and steering characteristics – tow vehicles can sometimes keep going in a straight line instead of going around the corner when this is the case. 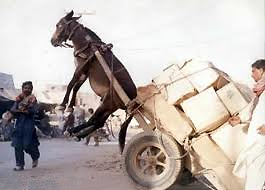 Do check that the bulk of the load is sitting over the axles and is secured so that the load does not move. Try a bit of practice at backing! It’s not always as simple as it might seem. Do master it before heading down to the dump. Many times I’ve seen plenty of people smiling at the driver who is trying to back the trailer with little success. Google Self Drive Car Crashes – but don’t panic. We wrote about the amazing driverless car from Google a couple of months ago. We’ve just heard the embarrassing news that it’s crashed! But relax. It seems that it was not in the ‘driver free’ mode, so the ‘driver in control’ is probably a lot more embarrassed than the boffins themselves. Stuff You Might Not Know About With Loans. When you’ve just about got enough money together but not quite or you need the whole lot to buy that new car, what are the options? Maybe you shouldn’t get the loan. There are some big items that we may need to take a loan out for. I’m thinking of a house, particularly. A new car is also one of those big items that do swallow a lot of cash. Being wary of over spending for that new car – or anything for that matter – is a good check for whether you might be able to hold off and save up the cash first before being to hasty in signing the dotted line for a loan. Yes, you might want the car but if you saved up before you bought the car, then quite a large sum of money can be saved in interest payments that you would need to pay in a loan – making the new car cheaper to buy in the long run. It’s amazing how quickly interest can build up on a car loan. If you are running on a tight budget, it is probably wise to hold off getting a loan because failure to meet the payments on a loan for a car definitely affects your credit rating in the future. A month or two of lower income or higher demands on your usable income (for example: a larger food bill, your rent goes up, car repairs…) means that it is a lot harder for people on a tighter budget to meet the demands of a car loan’s repayments. If you are already paying for rent or a mortgage, and your margins are tight, do think very carefully before applying for a car loan. So, what happens when it all goes pear-shaped? Missing one of the loan repayments usually results in a late fee. Loan agents would usually give you a call and remind you that you were not able to provide the payment on such-and-such a date. In most cases, lenders would try to work with you and determine a new date when you would pay for the missed payment. Digging yourself a deeper hole to get out of is when a payment has been delayed for 30 or more days. In the event where you were not able to pay the loan premiums for almost a month, lenders would be looking at this as a serious lapse and would most likely report this to credit reporting agencies. As outstanding loan repayments continue to build up for 90 days or more, repossession of the vehicle is the final outcome. Money lenders would send an agent that would handle the repossession process. A lot of the time, police officers are involved to ensure that the re-possession process goes without a hitch. Finally, lenders will usually resort to legal action when you are not able to meet the payment terms provided by the lender. After your car is sold on, the lender would sue you for not paying the amount you owe from the lending company. It gets really scary here because if you lose in court, you are required to pay the amount you owe, the penalties involved, and the expenses spent by the lender in seeking legal action. Ouch! There are such things as manageable loans. Sometimes they really are necessary (like when your car has died and you need a new one). As long as the loan repayments sit well inside your means to pay them, you’ll probably be fine. if you don’t have the cash for it, you probably don’t need it. On a positive note: keeping yourself free of debt means that you are much more capable of saving up for things in the future. And remember, Private Fleet are committed to finding all new-car buyers the best deals around. We Aussies seem quick to complain about anything, yet sometmes we need to open our eyes to what is happening overseas. OK, this isn’t a sermon, but how often do you moan about bus drivers, taxi driver,train drivers etc? We reckon if you were waiting at some traffic lights and an Aussie bus driver acted like this Russian one, then you really would have cause to complain!! This is an extreme case of making up time, but have you had any similar experiences with overseas bus or taxi drivers? If so we’d love to hear from you, so leave your comments below.